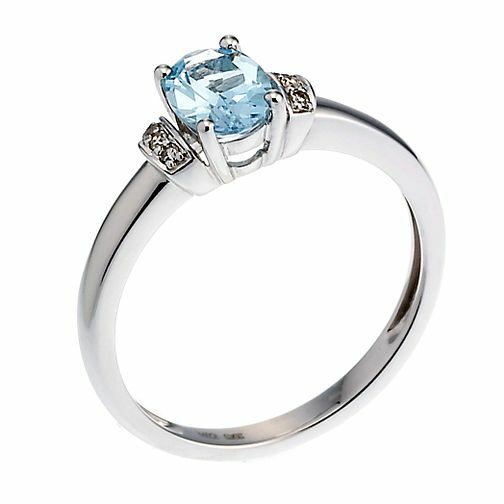 A stunning combination of diamonds and blue topaz set in 9ct white gold. Perfect as a gift for a loved one, whatever the occasion. 9ct white gold diamond and blue topaz ring is rated 4.6 out of 5 by 11. Rated 2 out of 5 by Anonymous from Pointless diamonds design I went to buy thid ring today, i saved up from december and waited till my size was in stock, (tiny fingers). I'm glad i saw it first the diamonds are so tiny they may aswell not be in the ring, make it more available then in price. The topaz is really bright too, so if you dont like sky blue its not for you. Rated 5 out of 5 by Anonymous from Gorgeous ring This topaz ring is my birth stone so this ring is very special to me.. I love it and it looks lovely on. Sparkling diamonds on each side of the topaz makes this ring one to have.